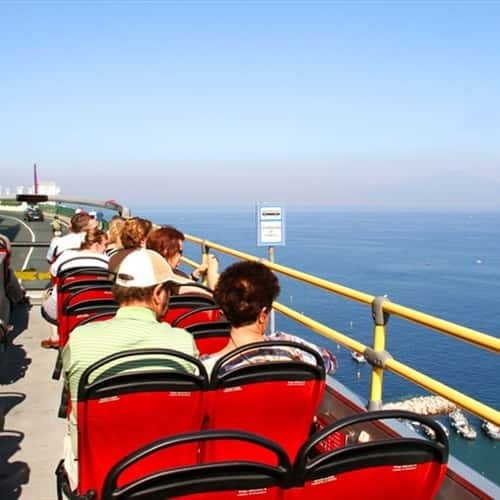 City Sightseeing Sorrento will let you discover the Mediterranean's pearl: an incredible tour to discover the history, the culture and the traditions of this wonderful land "the Sorrento's peninsula" together. Our tour will start from Sorrento, passing through Sant'Agnello till it arrives at Massa Lubrense; going again along the narrow streets that from the town centre, will take us to the splendid panoramic sheer terraces on the sea, typical of this land. The immensity of the sea and the rich vegetation characterized by continuous olive groves and sweet - smelling orange and lemon gardens will accompany us through the tour, in short a real triumph of nature. Not only the blue of the sea and the green of the hills will surprise us, but the two wonderful gulfs: that of Naples and that of Salerno, the island of Capri, the Mount Faito and the Vesuvio.